UPDATED: Tue., June 19, 2018, 5:07 p.m. 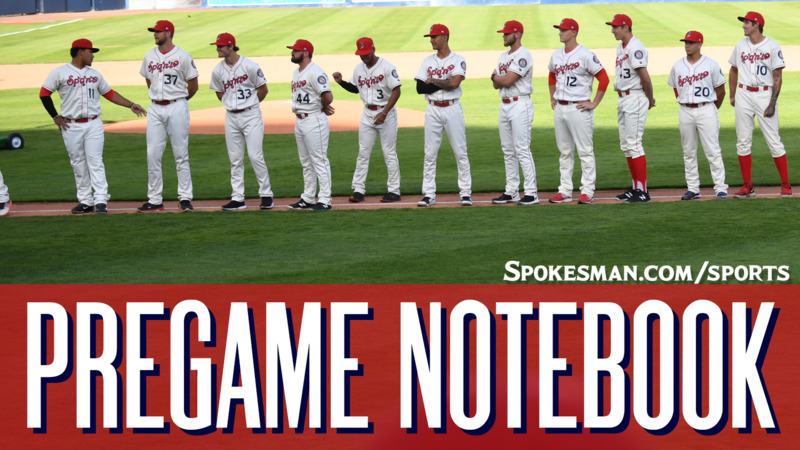 The Spokane Indians (1-3) host the Boise Hawks (3-1) in the finale of a five-game Northwest League season-opening series at Avista Stadium at 6:30 p.m. The Indians send RHP Ryan Dease against Boise LHP Alec Byrd. Dease, 19, makes his first NWL appearance of the season. He made a spot start for Low-A Hickory last Tuesday and pitched five shutout innings, allowing five hits and no walks with three strikeouts, earning the win. The Texas Rangers fourth-round pick out of high school in the 2017 MLB Draft pitched in 11 games with four starts for the Rangers Arizona League affiliate last season, going 3-1 with a 2.05 ERA and 0.909 WHIP over 22 innings with a 7.8 K/9. Last night: Kennard McDowell went 2 for 3 with an RBI and the visiting Boise Hawks (3-1) edged the Spokane Indians (1-3). Heating up: 1B/DH Curtis Terry has driven in a run in each of the team’s games this season with a pair of home runs, including a no-doubt solo shot in Monday’s 3-2 loss to Boise. His six RBIs are tied for the NWL lead with Boise’s Danny Edgeworth. Around the minors: Monday’s Northwest League and Texas Rangers affiliates results. Promotion: Fields of Green Sweepstakes & Azteca Taco Tuesday. One fan will win a yard makeover. The winner will win the professional services of the Spokane Indians award winning grounds crew for a day plus yard tips. Get a taco & tots for $3. Weather: Partly to mostly sunny. Game time temp 80 degrees, final out 69 degrees. Published: June 19, 2018, 3:47 p.m. Updated: June 19, 2018, 5:07 p.m.